Before you begin, make sure your exterior walls are sheathed and wrapped. First, snap several chalk lines to determine the locations of your studs. After that, use your circular saw to cut 1 1/4″ siding starter strips to install at the bottom of your home. Attach your starter strip to the bottom of your sheathing using nails. Measure the length you want your piece of siding to be, making sure to leave a small gap between the siding and the corner piece. After that, use your circular saw to cut it to size. If your siding has a protective paper covering, leave it on while you cut. Pre-drill 1/8″ pilot holes in your first piece of siding and drive two galvanized box nails into each stud. Make sure the nails penetrate at least one inch into the stud. Nail along the length of siding to attach it firmly to your home. Continue to snap chalk lines for your siding pieces and working from bottom to top, continue to install your siding. Make sure you overlap each piece by at least 1 1/4″. As you come across obstacles like windows or doors, make sure to measure and cut your siding accordingly. Use caulk to fill in the joints between the ends of your siding pieces and your corners. After that, remove the protective paper. 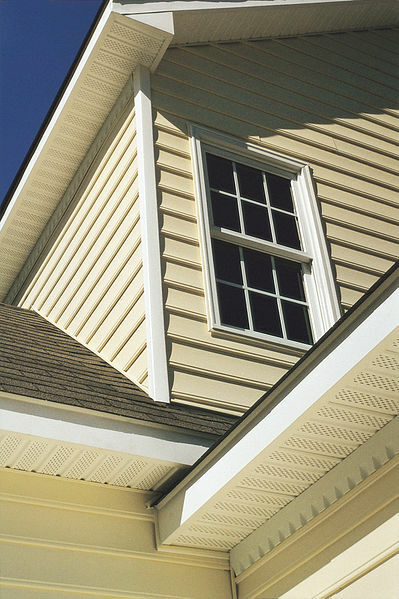 If your siding needs to be painted, make sure it’s clean and dry before painting it.